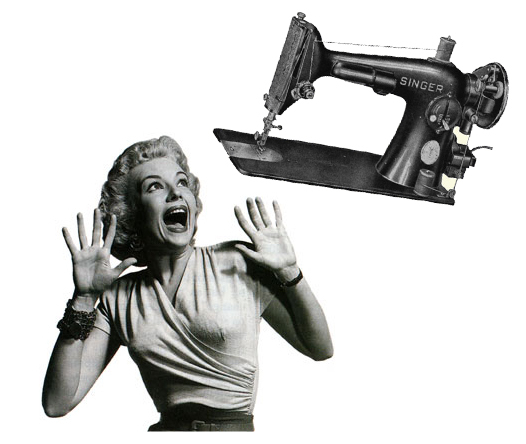 The Friday Five: 5 sewing fears | Sew Lindsay, Sew! 1. My biggest sewing fear is ruining fabric. I measure, re-measure, stare for awhile, empty the dishwasher and watch an episode of Hannah Montana before finally making a cut. After spending so much time searching for the perfect fabric combinations, the last thing I want to do is wreck what I’ve got. 2. Making ugly things. I want to take pride in my handmade items, not be ashamed to show them to my friends! 3. Making things that don’t fit. I haven’t really broken into the world of wearable items yet for this very reason. You know how sizes can vary from one shirt to another? The same goes for patterns, apparently. Hence the fear of creating an item that does not fit and cannot be fixed, thus ruining the fabric. See fear #1 listed above. 4. Breaking the sewing machine. After so much research, and the final investment in what is essentially a household appliance that I’d like to keep for some time, the last thing I want to do is break it by using it incorrectly. Since I’m still learning, this is a very real possibility, so I am thankful for all of the machine’s features that are in place to avoid as many beginner’s catastrophes as possible. However, it is still a lingering fear. 5. Accidentally putting my finger under the pulsating needle. Again, I think the machine has specific safety features to avoid such an incident. But one look at that needle stabbing the air with lightning speed keeps the fear alive. Lindsay, I have thoroughly enjoyed your blog. Laura forwarded it on to me. I am amazed at all the research you did when you bought your sewing machine. I knew you always had a unique writing style and you did a wonderful job of keeping me inteested. Your projects are fun and so is your blog. I look forward to seeing more in the future. Happy sewing.